Shavige Malleshwara Hills, Kumaraswamy, Bangalore- 560078, Karnataka, India. To keep pace with the technological developments happening in Industry, DSI has an excellent research atmosphere supported by a high caliber staff. Professors having rich academic/Industry and R & D exposure with experience of having worked in reputed National and International organizations drive the research activities in the campus. DSI offers a quality research training experience for its students with state of the art facilities in various departments. DSI maintains its relevance to world-class research by linking with industry, business and leading R & D organizations through local and international research networks. There are Twenty one Research centers recognized by the Visvesvaraya Technological University. Heads of each Department coordinate all the research activities of the university and monitor the M.Phil, M.S and Ph.D research programs from admission to the award of degrees, ensuring quality in research and compliance with the rules and regulations of the university. There are more than 120 candidates who have registered for Ph.Ds in different Research Centers of DSI. DSI is committed to provide excellence in research and contribute to the development of innovative technologies for the future. Each department have worked out & identified two thrust areas of research for undertaking as a major program of the department. Under each thrust area the departments are supporting student project at Under-Graduate level, Project work at Post Graduate level and formulation of R & D project for getting support from sponsoring agencies. Sponsored Research Programs in different fields of Engineering are in progress with a total projects funding of Rs. 3 crores. AICTE, Institution of Engineers, VTU,DRDO, ISRO, DST, DBT have sponsored projects to different departments. All these sponsored Research projects are implemented in each department under the umbrella of RIIC, which is a registered R & D unit by DSIR. Advisory Committees are set up for each department with experts from Industries and R&D organizations. The advisory committees help the departments in all their Research Initiatives. Forty Two MOUs have been signed with various Industries such as IBM, Unisys, Intel, FKCCI and other SMEs. DSI has an elite placement division to facilitate the placements for all students. The Centre provides pre-placement training in soft skills to all students to enable them to apprise to the modern corporate requirements in association with CIL - Centre for Innovation & Leadership and HR Division. Sharada Girls Hostel Telephone Number : 080 – 42161727. Right of admission to hostel is reserved. Hostel fees must be paid for the full year before admission to the Hostel. Hostel fee will not be refunded under any circumstances. Caution deposit will be returned at the end of the academic year. NRI/Foreign students must pay their fees in USD. Boarders shall not change rooms without the written permission of the Warden. A boarder must always carry the Identification card issued by the Warden. Guests are not permitted into the Hostel. Under exceptional circumstances, guests will be allowed on obtaining written permission from the Warden. Each boarder must pay the mess and other Hostel Charges regularly before the due date. The mess charges will be levied on dividing system or as levied by the appointed mess contractor. 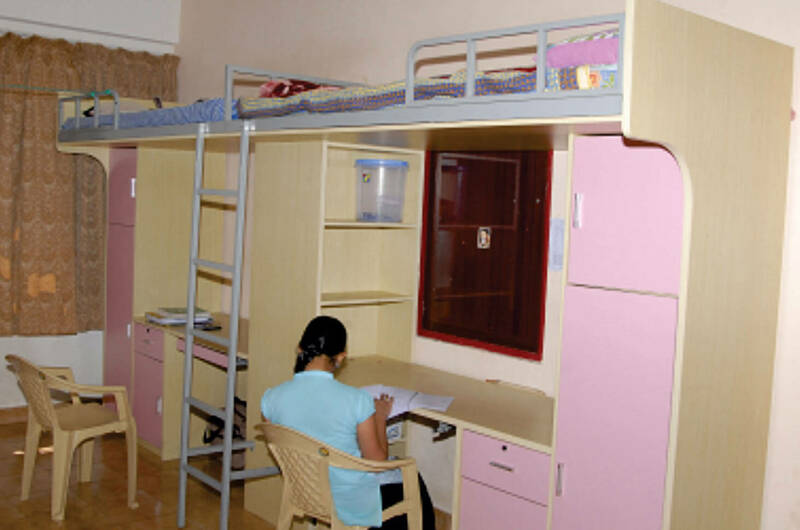 Inmates shall handle carefully furniture and other hostel property as if it was owned by them. Appropriate penalty will be levied for breakage, destruction of college property on the students. Breakfast, lunch, evening snacks, dinner will be served only during the scheduled time. Late comers will not be entertained. Parties, birthday celebrations etc., within the Hostel are prohibited. The Hostel inmates must conduct themselves in a disciplined manner with the employees and other inmates of the Hostel. Outside food items will not be allowed in the dining hall. Self - service may be introduced in case of emergency without prior notice. Parking of vehicles in front of the Hostel and within the premises of Hostel is totally prohibited. Attendance will be taken everyday and abstention without permission will be viewed seriously. Loud music, smoking, gambling, playing cards, shouting and consumption of alcoholic beverages are strictly prohibited within and in the vicinity of the Hostels. Viewing of pornographic/obscene films/photos/ material with or without the help of computer in the Hostel is totally prohibited. Ragging is a serious offense and is strictly banned. The Hostel inmates must return to the Hostel in the evening before the stipulated time, and those who want to go to local guardian’s place and for other genuine reason and not in a position to return on the same day must apply in writing to the Warden and obtain prior permission. Inmates shall not spit and disfigure or break or damage the wall, floors, furniture and any other properties/belongings of the Hostel/other inmates, these offenses will attract heavy penalties. The inmates shall lock the door of the room when they go out and shall keep the door closed when they are inside the room. The inmates shall not cause any kind of disturbance to others. The Warden reserves the right to instruct an inmate to vacate the Hostel at any time without assigning any reason whatsoever. Use of prohibited drugs etc., by the Hostel inmates is strictly prohibited. Each inmate shall conduct himself / herself in the best possible manner and shall not do anything that causes annoyance or problem to others. Bad conduct will result in expulsion from the Hostel. The Hostel authorities are not responsible in any manner for the loss or damage to the personal belongings of the student inmates (including cash and other valuables). The inmates are advised not to waste food etc., served in their own interest. The only campus to plan and execute Country Week programmes. The IBM Centre of Excellence at DSI is ranked as the best in the country. The student chapter of IEEE at DSI is declared as the Best in the country. DSI has the Largest Academic Alliances with universities across the world. DSI wins the 2010-11 Best Display Award in the Deccan Herald education exhibition against 300 colleges. DSI is the only campus in the city to host senior managers from IBM representing this MNC from over 30 countries. DSI co-founds the International Institute for Sustainable Enterprise under the leadership of Dr. Stuart Hart of Cornell University. Institution’s wide range of education programs can open doors to a successful and rewarding career. Supported by modern infrastructure and an innovative bent of mind, our faculty members enjoy strong links with industry. Their involvement in research and development brings a unique authority to the teaching of our degrees. Reinforced by a dynamic student culture and state-of-the-art facilities that are among the best in the country, DSI is at the forefront of cutting edge research. Our Institutions are characterized by the quality of its education across a broad range of disciplines from school to post graduation. It is a seat of higher learning, with an international focus on all its activities and standards. Beyond the quality of education, it is the quality of life in the institution campus that provides for the academic growth and overall development of the students. It is our sincere conviction to give the best to the students which enables them to keep pace with rapid changes and progress and thus become responsible citizens of the future world. Welcome to Dayananda Sagar Institutions. Wishing you all the best. May the blessings of the Almighty be with you. The Motto of Dayananda Sagar Institutions is “Education Completes a Man”. Our aim is to contribute to society at large and professional needs in particular, by people sharpened with skills and knowledge so that they shape out to be useful and responsible citizens of the country. Students are encouraged to achieve a “Sound Mind in a Sound Body”. Welcome to the unique Dayananda Sagar Institutions. Wishing you all the best.
" DSI intends to offer an ambience for intellectual thinking and academic interaction to mould future leaders "
To be a centre of excellence in education, research & training and to produce citizens with exceptional leadership qualities to serve national and global needs. To achieve our objectives in an environment that enhances creativity, innovation and scholarly pursuits while adhering to our vision. The Pursuit of Excellence - A commitment to strive continuously to improve ourselves and our systems with the aim of becoming the best in our field. Fairness - A commitment to objectivity and impartiality, to earn the trust and respect of society. Leadership - A commitment to lead responsively and creatively in educational and research processes. Integrity and Transparency - A commitment to be ethical, sincere and transparent in all activities and to treat all individuals with dignity and respect.